There are adequate animated films on this planet. Technology has made sure that every animation-lover is able to access the finest of these experiences easily. What is your favorite animation? Is it Finding Nemo, Spirit, Toy Story or Lion King? Or probably it is the more recent animations like The Croods and Ice Age series? These are just some of the most popular animated movies that have ever been released. They are not only funny but they are also exceedingly realistic. You could easily get lost in the character’s world and that is the same thing that happens with gaming. Characters are very important in video games. When you are designing the games you should take a good amount of time to think about your characters. It is the characters who absorb the player into the world of the game. There are those games that you play and you find yourself moving your body and shifting like the character in the game. If the car is swerving off the road you are bound to bending on your seat in a bid to try and bring the car back onto the road. The characters should tell a story or help to tell the story in the game. There is always a protagonist and an antagonist in the action games. There is always some money or a medal to be won if you are playing the racing games and there is a character who will win these rewards. If you want people to be addicted to your games then you will have to make sure that the characters are developed excellently. There is nothing wrong with drawing on paper. Have a drawing pad with you at all times. You can draw whatever comes to mind and write down your ideas as they come. There are those ideas that will come when you are very far away from your computer. A risk of getting too engrossed in the details of the characters is always present. There are game designers who tend to get carried away on the details of one character and then they forget all about the others. There must be something distinguishing one character from the next. Sometimes it is something as small as the color of the hair and the pants that they are wearing. This is the second decade of the twenty first century. No one wants to play games where the characters walk like Super Mario or the brick people on the Brick Game. The world is all about 3D graphics or super high definition stuff. The graphics should be almost real to the point that someone completely forgets that they are playing a game. This adds onto the excitement. 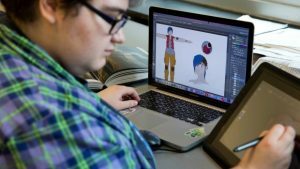 Therefore, get in touch with an excellent graphics designer or better yet sign up for animation classes and you will learn everything about creating animated movies, games and so forth.